One way to ensure you run a high-engagement webinar is creating a “buzz” about your own session. You can do this by sharing in advance some of its content with your audience – as a “teaser”. This is also an opportunity to showcase the “difference” of your online sessions from the average “death by PowerPoint” webinar so common today. Know that online “less is more”, and are courageous in making tough choices, like leaving the “nice to know” contents out of their webinar agendas. To start thinking what should and should not be in the agenda. This prepares the audience and is particularly helpful when your webinars sessions are NOT like the average webinar available out there. 4. What key contents will be part of the agenda. Sometimes I have simply attached the interview Q&A to an email and sent it in advance; in other occasions I have recorded the three-minute interview and shared it through an audio-clip online service. You will noticed the benefits of this work right from the start: participants more focused on the session’s topic, a webinar design centered on a few, key content elements and a clear guideline for you to measure how your performance in the webinar will be rated. 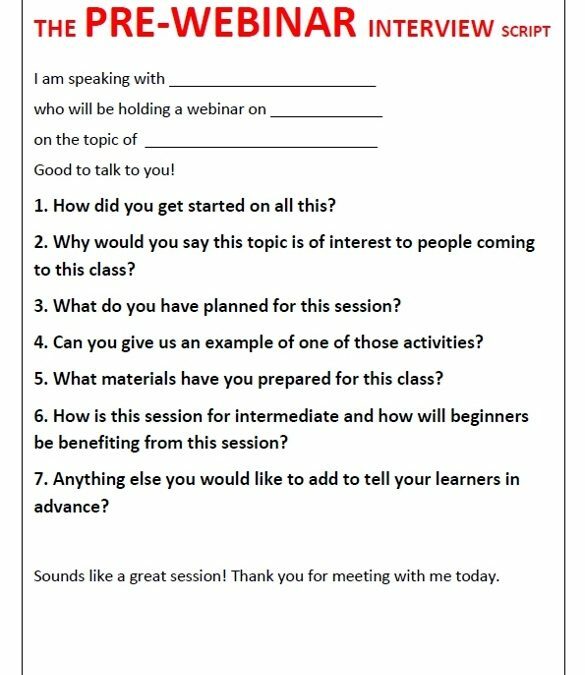 Download the PRE-WEBINAR Interview script by clicking here.